As China has been the world’s biggest energy consumer since 2009 and is the biggest greenhouse gas emitter (International Energy Agency, 2017), it should play a crucial role in the global effort to reduce CO2 emissions and thereby limit climate change. Notwithstanding the fact that it consumes more coal than any other country by far (IEA, 2018), the country has shown in recent years a clear intention to become cleaner and greener. Indeed, the Chinese government has taken several engagements in that direction, including the signature of a historic deal with the United States in 2014, but also, at a national level, policies such as the 13th Five Year Plan (2016-2020). In the former, China vowed to have 20% of its electricity produced through renewable sources by 2030. Within the latter, the National Energy Administration has set ambitious climate and energy-related targets for the country. For instance, it aims to increase non-fossil fuel electricity production (which does not only include renewables, but also nuclear energy for example) to 15%, sets an energy consumption cap at 5 gigatons of coal equivalent, and intends on reducing its carbon intensity by 40-45% compared to 2005 levels, all this to be achieved by 2020 (China National Energy Administration, 2016). Furthermore, Xi Jinping thought, included in the constitution as of this year, affirms the national will to create a “social and ecological civilization” (Amendment to the Constitution of the People’s Republic of China as Adopted by the First Session of the 13th National People’s Congress on March 11, 2018). Given the fact that the environment is rarely included in constitutions, this is clearly a landmark event and is evidence of a clear evolution both in mindset and priorities of the Chinese government. In order to achieve the goals that it has set itself, China has attempted to make major changes in its electricity sector, including increasing the importance of renewables in its electricity mix. Thanks to aggressive public policies in that direction, it has met with impressive success. Indeed, China’s renewable energy fleet is currently the biggest in the world in terms of installed capacity. Nevertheless, China is still struggling to make use of this capacity. Indeed, due to complications, renewables do not contribute as much as they could to electricity production. For instance, in addition to others, the size, the organization and geographical characteristics of the Chinese territory seems to be major impediments. What are the main obstacles to renewable electricity integration in China? What hinders the Chinese government making use of those resources? 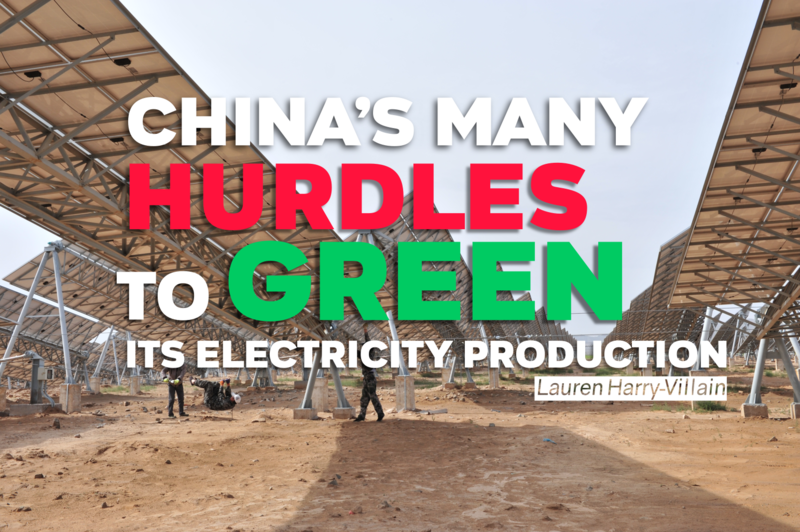 How is the Chinese territory an obstacle to efficient renewable energy development? To be noted, as we focus on renewable electricity production, renewables in this article will be limited to wind, solar and to an extent hydropower, but not other sources such as bioenergy, which can produce electricity on demand and do not have the issue of intermittency. As the graph below shows, China’s renewable capacity exceeds that of any other single country and IEA predictions show that this will remain the case until 2023 at the very least. To be precise, its installed capacity reached 1,614GW in 2017 (Climatescope, 2017). Granted, the share of renewables in its electricity mix is still relatively low, especially compared to countries such as Brazil. However, its energy consumption is such that this is already a huge achievement. In addition, according to the Climatescope, an initiative supported by Bloomberg New Energy Finance and UKAid which ranks developing nations based on their clean energy activities, China is the most active country in this policy area. Indeed, the Chinese feed-in tariff for wind and solar energy was the key to renewable capacity growth for many years, even if it is currently being gradually phased out faster than anticipated (IEA, 2018). The first reason why renewables are not being used to their full potential is linked to unexpected low nationwide electricity demand growth. Indeed, power demand growth has dropped from 12% on average between 2000 and 2010 to 6% since the start of this decade (IEA, 2018). As a result, the national power oversupply reached 35% in 2016 (Bloomberg New Energy Finance, 2017). As the map below shows, most provinces have an available capacity for all types of energy sources which is higher than their peak demand: this means that they are able to completely fulfill their energy needs. 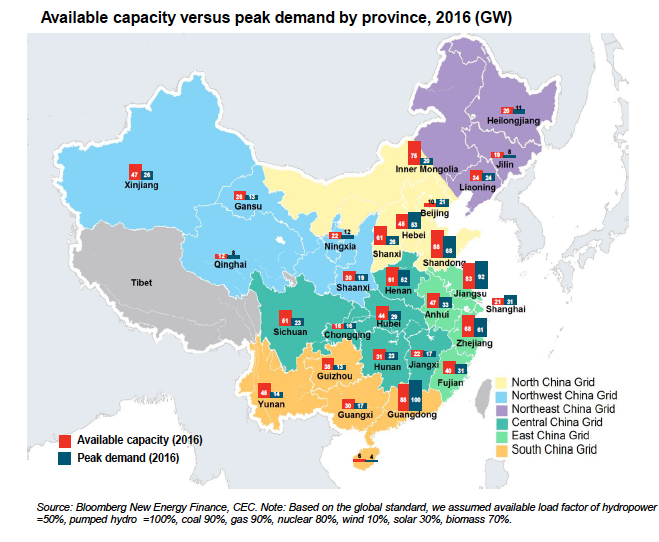 The provinces that have a higher demand than available capacity are Beijing, Shanghai, Jiangsu and Guangzhou. An improved interconnexion between provinces would solve this issue and help balance energy capacity and demand countrywide. However, this is costly and implies transportation losses, thus its development is limited. As this relatively low increase of demand was not anticipated, more and more electricity capacity kept on being added to the grid. Between 2005 and 2015, the annual growth rate of this electricity capacity amounted 11.5% (BNEF, 2017). One reason for this lies in the public policies that supported the addition of new capacity. For instance, since public subsidies to produce renewable plants (especially solar photovoltaic panels and wind turbines) were quite advantageous, a significant number were built even though demand growth was fairly slow. This issue of overcapacity has huge consequences on the renewable energy system because the Chinese electricity dispatch rules are not optimized for this new energy management systems paradigm. For now, China uses a system based on the notion of fair dispatch (IEA, 2018) to distribute electricity, which means that the number of operating hours of a power plant is determined in advance on an annual basis (IEA, 2018), most of the time using long term contracts. This was especially appropriate for China when its electricity capacity was limited, compared to its overall demand. Indeed, this system makes the dispatch much more reliable than in other dispatch systems (such as the merit order, as shown in the diagram below), and was needed to ensure universal access to electricity. However, now that the electricity system in China has evolved and that there is overcapacity, the fair dispatch system only generates imbalances in the system as it does not consider efficiency rates or environmental characteristics. As a result, renewables are not prioritized over coal, for instance, which remains cheap and very reliable, and thus have low guaranteed operating hours compared to what they could produce. The power reform that was launched in 2016 attempts to transition towards the merit order system in order to boost the utilization of renewable energy production, but its magnitude is so huge that it is taking time and meeting resistances. Source : Bahar, H. and J. Sauvage (2013), “Cross-Border Trade in Electricity and the Development of Renewables-Based Electric Power: Lessons from Europe”, OECD Trade and Environment Working Papers, 2013/02, OECD Publishing. Curtailment is defined as « a reduction in the output of a generator from what it could otherwise produce given available resources, typically on an involuntary basis (National Renewable Energy Laboratory, 2014). It has been a major impediment in increasing the share of renewables in the national electricity production. In 2017 in the whole country, curtailment reached 12% of wind energy, 6% of solar photovoltaic panels, and 4% of hydropower (IEA, 2018). This is already huge, but the situation is much worse in some provinces where renewable electricity capacity is high. For instance, in the third quarter of 2017, curtailment amounted to 33% in Gansu province, and 29.3% in Xinjiang provinces (NEA, 2018). This phenomenon is due to two main factors, both linked to the characteristics of the Chinese territory: a geographical disconnect between supply and demand and issues linked to transmission, as detailed below. 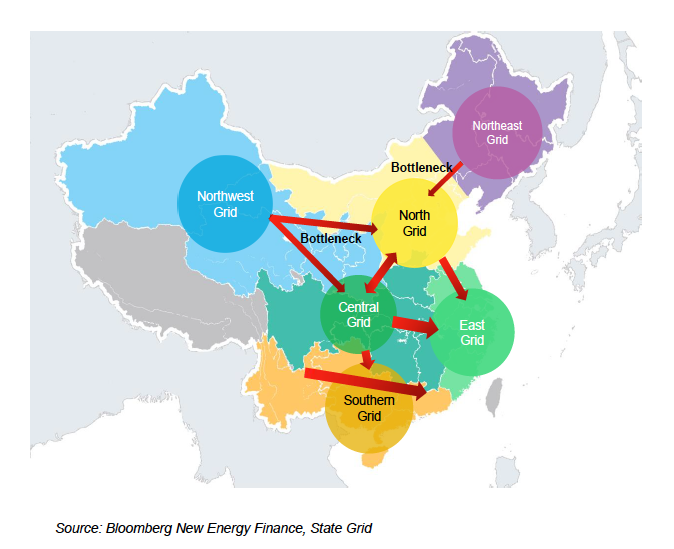 As the map below epitomizes it, there is a major geographical disconnect between the location of China’s renewable energy potential, which is mostly located in the northwest and in the north of the country, and the majority of its energy demand, which is mostly situated in the east in the coastal areas. 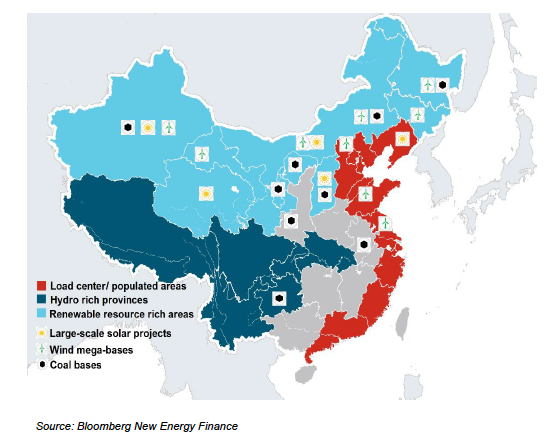 To give an idea of the magnitude of this issue, about 70% of China’s wind and solar farms are located in these high potential areas (Greentech Media, 2017). Given the size of the country (9,600,000km2), taking electricity from the west of the country to the east not only implies that a significant part of the electricity is lost during transportation but also necessitates having the adequate electricity infrastructure. This is not the case in China for several reasons. At the national scale, the Chinese grid drastically lacks in ultra-high voltage transmission lines going from the west and the north to the east of the country. This means that it is physically difficult to move the renewable electricity from where it is produced to where it needs to go. This is due to the fact that China has 6 different grids which are connected to each other only to a limited extent. The map below displays this phenomenon: the arrows show the transmission connections between the different grids and the bottlenecks are clearly indicated. As a result, there are severe transmission bottlenecks from one grid to the next. In addition, some renewable plants are located in areas that are so remote that connecting them to the regional grid is already an issue and a huge additional investment. Overall, curtailment is a difficult problem to resolve, because it is linked to geographical conditions that are very expensive to counterbalance. The Chinese government has nevertheless made major efforts to fight against this issue and overcapacity and increase renewable integration. The Chinese government is now putting major brakes on renewable capacity additions in remote provinces. Not only is it limiting public subsidies (such as the feed-in tariff) for wind and for solar in general, but it is also attempting to increase control on deployment patterns. New capacity additions must therefore be created in provinces other than the north and northwest in order to situate renewable electricity production closer to consumption hubs. Indeed, a quota was created at the province level for wind and solar (but also coal) until 2020. However, this policy seems to be enforced only to a limited extent as new wind plants in Heilongjiang and Inner Mongolia (Northern region) have been allowed and solar PV is also expanding (IEA, 2018). As inadequate energy infrastructure is one of the main causes of curtailment, this is a priority for the Chinese government. One of the goals of the 13th Five Year Plan (although non-binding) is to solve this issue of territory by connecting at least 210 GW of wind, 105 GW of solar photovoltaic panels and 5GW of solar thermal energy to a main grid by 2020 (NEA, 2016). In order to do that, China is planning to build 16 additional ultra-voltage DC lines between the western provinces and the coastal areas by 2020. Yet, it seems that, in practice, some of these lines will not be used for renewable electricity production (BNEF, 2017). Whether this goal will be achieved thus remains to be seen. As mentioned previously, the current power reform is attempting to change the Chinese dispatch system which is not adapted to the electricity system. For instance, in order to facilitate renewable access to the grid, the government is now requiring that grid operators purchase all the electricity produced by renewable sources (meaning wind and solar energy), in order to limit non-technical curtailment as much as possible. In general, China is transitioning to a merit order dispatch system, which is already in place in most countries. 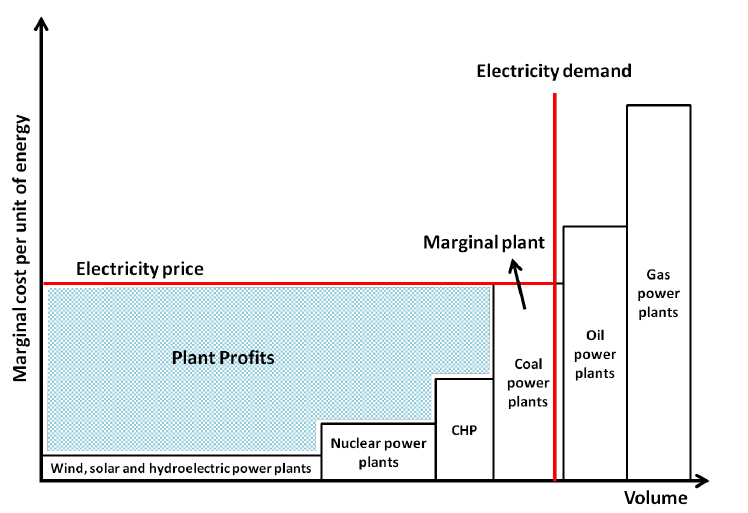 This means that access to the grid is based on marginal cost. Renewables have no marginal cost (except for maintenance) meaning that they have first access to the grid. Nevertheless, this transition is occurring quite slowly in China due to the importance of coal in the electricity mix coupled with policies that already favor this energy source. More general policies to incite renewable electricity production have progressively been launched. For example, in 2017, the Chinese government decided to launch the Renewable Energy Credit system, even if it was first designed on a voluntary basis. This is a rough equivalent to the green certificate that already exists in France and many other countries. Electricity market participants (ex: grid companies, electricity retailers, etc) must obtain renewable energy certificates (one MWh of renewable energy is equivalent to a certificate) to prove that a certain amount of renewable electricity was produced. If they do not reach their government-imposed targets, they must buy certificates at a price decided on by the NDRC. Another example of this is simply the carbon market. Given the importance of coal in the electricity mix and its carbon intensity, this policy is clearly favoring renewable electricity production. Overall, government action to reduce curtailment and overcapacity have proved to be useful to an extent. Indeed, according to the International Energy Agency, curtailment of wind has decreased by 5 percentage points in 2017. As a conclusion, the Chinese government is remaining proactive towards the issues of renewable electricity integration. Nevertheless, solving the issues of overcapacity and curtailment linked to territorial factors will be a long process and results will probably take time to emerge. In addition, the process can be further delayed by the fact that electricity-producing and coal companies have huge political power in China and can exert huge pressure on the government, despite the fact that they are state-owned enterprises. They may thus attempt to block elements of the power reform that would favor renewable electricity production. On a more general note, while improving renewable electricity access to the grid is an important part of reducing Chinese CO2 emissions, it is still aggressively reducing coal-fired electricity that will have the biggest impact. This is clear to the Chinese government and many especially inefficient coal-fired plants have recently been closed (International Energy Agency, 2017), but the advantages that this source has for the country remain significant. Indeed, it is available locally, abundant, easy to extract, easy to transport, etc. 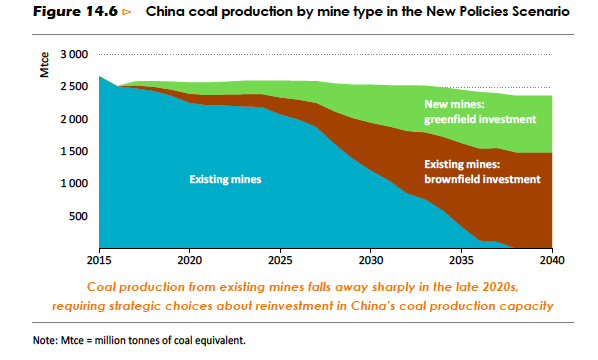 Thus, it is highly unlikely that coal will lose much of its importance in China in the coming decades. The graph below displays expected coal production in China in the IEA’s New Policies Scenario, which is based on “current and announced energy policies, including those of the Paris Agreement” (IEA, 2017). This clearly shows, not only that coal production will not be drastically reduced between now and 2040, but also that investment in coal will remain high, showing the investors’ faith that it will be maintained in the long term. While new technologies (such as Carbon Capture Usage and Storage) to limit the CO2 emissions of coal-fired electricity production are becoming effective, they are far from being widespread in China and thus cannot significantly reduce CO2 emissions from coal usage. Therefore, while the Chinese government is clearly showing goodwill in making strong efforts to boost the place of renewable electricity in its electricity mix despite significant difficulties, this will not be a sufficient measure to have a substantial impact on CO2 emissions reduction for China, as the center of its problem is coal remaining its main energy source. Environment Working Papers, 2013/02, OECD Publishing.